Papa Lemon was born in West, Mississippi on Dec. 6, 1896, and passed away on Oct. 29, 1973. The last time I saw my grandfather was when they closed the coffin at his funeral. I could not believe that would be the end. _No more games of checkers or taking me to Miss Annie B’s General Store for candy or pop. Ten years was not enough. I could not stop thinking of Papa Lemon everyday for thirty years. I thank God for giving me the vision to share my grandfather with the world. Kids of all ages I give you my grandfather Papa Lemon. 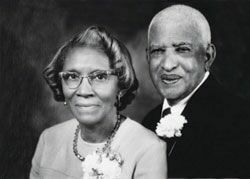 Mama Sarah, the wife of Papa Lemon, was born in West, Mississippi on Jan. 26, 1903. My grandmother, lived to be 101 years old. Mama Sarah was the sweetest lady I ever knew. _I never heard my grandmother raise her voice. I loved for her to tell me stories about how she grew up, and the life she had with Papa Lemon. She found good in everyone, never seeing the negative in people. With her last words she looked to heaven and said “It’s so beautiful,” and passed away, and that’s how she was so beautiful. Papa Lemon and Mama Sarah had nine children and numerous grand and great grand children. Life is sweet when your children read Papa Lemon books….they teach our children the much needed important lessons of a morally grounded and spiritually rooted life. Thank you Papa!